Distribution: Open forests of the central coastal area of New South Wales. Derivation of Name: Crowea....After James Crowe, 18th and 19th century surgeon and botanist. saligna....From Latin salignus, of the willow, referring to supposed similarity of the leaves to the willow, Salix. Crowea is a small genus of three species which is closely related to Eriostemon and Philotheca. All species have been cultivated fairly widely. Crowea saligna is a small shrub up to a metre or more high. It has elliptic or lance-shaped leaves up to 80 mm long by 20 mm wide which are dotted with oil glands. 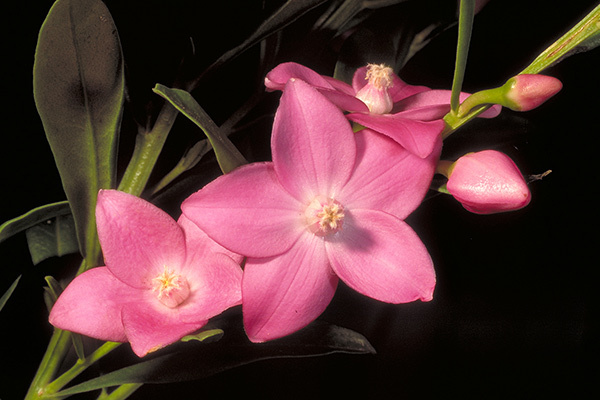 Flowers are 5-petalled and usually range from pale to mid pink in colour. The flowers are usually quite large with some forms having flowers up to 45 mm diameter. They are usually seen in late summer through to mid winter. In cultivation, C.saligna prefers a well drained position in sun or semi shade. It prefers moist soils but will tolerate extended dry periods once established. Some forms are more hardy than others - the form known as "Poorinda Ecstasy" with large light pink flowers seems to be one of the most adaptable to a range of climates. The species is tolerant of at least moderate frosts and is usually pest free but can sometimes be affected by scale and sooty mould. A very popular cultivar known as "Festival" is believed to be a hybrid between C.exalata and C.saligna but it seems to have greater affinity with C.exalata. 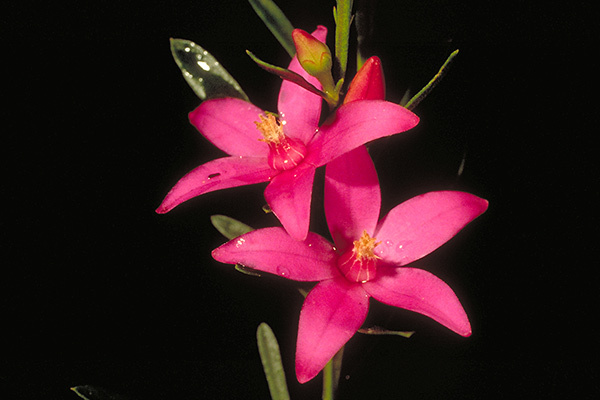 This cultivar has deep pink flowers. In common with most members of the Rutaceae, propagation of C.saligna from seed is difficult although garden plants will sometimes produce chance seedlings of their own accord. Cuttings usually strike readily from current season's growth. Crowea 'Festival' must be propagatede by cuttings as seed will not come true to type.